Kilskyre and Ballinlough Parish within sight of Loughcrew and close to the monastic town of Kells has a very rich heritage. 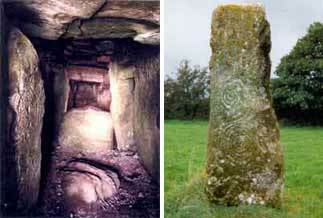 This includes several passage tomb cemeteries in Corstown, Kingsmountain and Clonasilla; three important early Christian monastic sites at Kilskyre, Clonabraney and Diamor, its Norman Castles, Mass Rocks and Great Houses. It has produced its poets and heros, its scholarly monks its sportsmen and women, its leaders of Church and State. The earliest reference to Christianity in Kilskyre is in the Martyrology of Tallagh 800AD. It records that a monastery was founded here in the 6th Century called Cill Scire “the Church of St. Schiria”. Schiria was a daughter of Eugene who was a great grandson of Niall of the Nine Hostages, King of Ireland, when St. Patrick was brought to Ireland as a slave. She was remarkable for her works of penance and her love of fasting. Her name is recorded among those abbesses who met St. Colmcille at Eardia a town in Sligo in 580.A.D. She died towards the end of the 6th Century. The ruins of this monastery, round tower and some ancient tombs are preserved opposite the present Church. Cill Scire became a large and noted centre of learning and worship. It was plundered and burned by the Danes in 949 A.D. and on two later occasions. 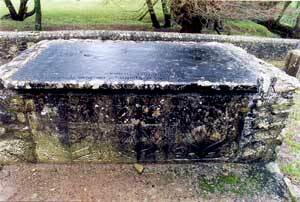 It was also plundered by Diarmuid McMurrough, King of Leinster and the English in 1170 A.D. It became a Parish church in the 13th century. It was taken over by the Reformers at the close of the 16th century and went into decline. During the Norman period this area was under the control of the Tuites, the Cusacks and later the Plunket family The “Old Faire Castle” of Kilskeer referred to in the Down Survey 1670 was located nearby. 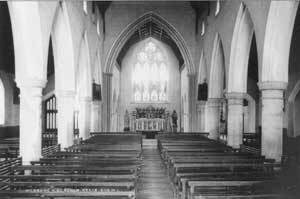 In the 17-18 centuries there were Churches at the junction of the Crossakiel and Boltown roads and also beside the present Church which was built by Fr. Kelly 1845-52. Designed by J.J. McCarthy it is a fine example of the early McCarthy style. 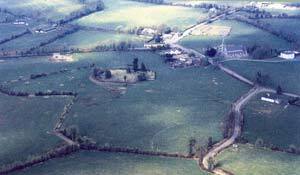 The earliest recorded Church in Ballinlough was a building erected by Fr. Mark Plunkett in the early 1700’s. It was succeeded by two others, the last of which was completed by Fr. Kelly. St. Caoimhin Breac established a monastery in Clonabraney in the 6th century on a location that may have been an earlier passage tomb cemetery. There is an old cemetery on the site and it has been beautifully restored by the local community. There was also a Church in Diamor (meaning solitude) dedicated to St. Finian. It was surrounded by a Puritan army in Cromwells time and several worshippers were put to death Its ruins are still visible. The Tain Trail runs through the parish. The men of Connaught led by Queen Maeve encamped in Crossakiel on their way to capture the Brown Bull of Cooley. Brian 0’Higgins the well known Gaelic scholar, poet, and historian, wasborn in Glenamona Kilskyre in 1882. He is best known for the Wolfe Tone Annual which he produced for over 30 years. He died in 1963. Jim Connell was born in Rathniska Kilskyre in 1852. He composed the Red Flag the anthem of the International Labour Movement. After he was forced to emigrate to England he became a major figure in the trade union movement there. 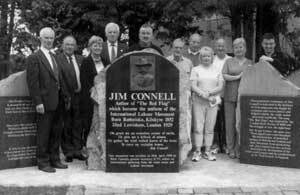 A monument to his memory was unveiled in Kilskyre on 26th April 1998. He died in 1929. Manifesto regarded as the greatest Grand National Horse of all time was owned by Mr. Harry Dyas of Boltown Hall Kilskyre. He won the Grand National twice and was third 3 times between 1897 and 1903. He holds the record for the highest weight 12 st. 7lbs. carried by winning horse. 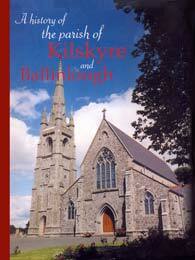 For a detailed treatment of the History of the Parish see A History of Kilskyre and Ballinlough compiled by Kilskyre Ballinlough Historical Society 2004 available in local shops and from the Parochial House.